Steely Nigeria battled their way into the Final of the 11th Women Africa Cup of Nations after a 4-2 penalty shoot-out defeat of Cameroon following a scoreless 120 –minute attrition in Accra on Tuesday. The feat also guaranteed that Nigeria will maintain her record of appearing at every edition of the FIFA Women’s World Cup when the world’s best teams gather in France next year summer. The Indomitable Lionesses played a clever, controlled game at the Accra Sports Stadium and certainly looked quite skilful against the Cup holders, but the experienced Super Falcons held them at bay, and when the defence got breached, goalkeeper Tochukwu Oluehi was there to keep things tidy. Lithe and sharp forward, Onguene came close in the 4th minute with a rasping shot, apparently from nowhere, which Tochukwu diverted, and three minutes later, the Lionesses were on the prowl again with a firm header, but Oluehi again was alert. In the 10th minute, Gaelle Enganamouit tested the Nigeria goal with a snapshot. Again Oluehi was aware. In the second half, the fit and technically savvy Cameroonians tried to pull strings from the midfield, only to meet their match in Halimatu Ayinde, Ngozi Okobi and Rita Chikwelu. Okobi wasted a glorious chance in the 54th minute and at the other end, Oluehi again came to the rescue as Ngo Mbeleck’s chip appeared headed for the net. Both teams hung on in a tedious, tiring extra time, with players spending quality time on the floor. In the penalty shoot-out, Njoya Ajara and Raisa Feudjio scored for the Lionesses, with Onome Ebi and Rasheedat Ajibade netting for Nigeria, but Enganamouit’s effort was caught by Oluehi and after Oshoala scored to put Nigeria ahead, the tireless Ngo Mbeleck saw her kick fly past the goalpost. Defender Ngozi Ebere then put her effort firmly past goalkeeper Ngo Ndom to put Nigeria in the final and earn a ticket to the 2019 FIFA Women’s World Cup in France. 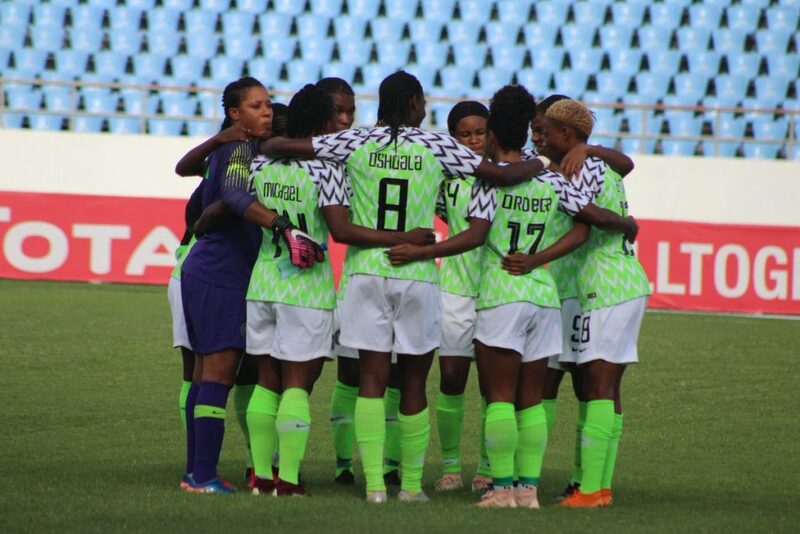 The Super Falcons will await the winner of the South Africa/Mali semi-final, played in Cape Coast later in the evening, in Saturday’s Final at the Accra Sports Stadium. The Lionesses can still qualify for the World Cup if they win the losers’ final in Cape Coast on Friday.